Rudy’s Country Store and Bar-B-Q Creamed Corn has to be one of my favorite ways to enjoy creamed corn. If you have never been in Texas and you haven’t been to Rudy’s Country Store and Bar-B-Q you are missing out. To tell you the truth I wouldn’t have tried Rudy’s Country Store and Bar-B-Q Creamed Corn if it wasn’t for folks like yourself. I have been enjoying the Bar-B-Q at Rudy’s Country Store for a while now. I love that you can buy their delicious food by the pound. In fact, it is the preferred way to purchase Bar-B-Q there. I love their simplicity, they sell a variety of meats and a few sides. In Texas, the sides of Bar-B-Q mainly consist of dill pickles and sliced onions. 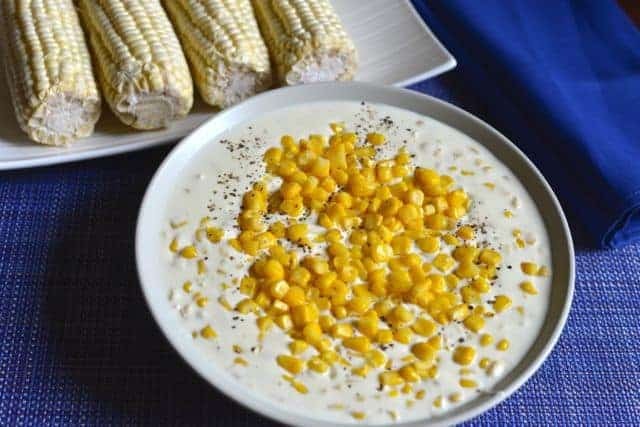 This creamed corn is very easy to put together, it is made with a few simple ingredients. Frozen corn, heavy cream, cream cheese, and sugar make for a thick rich sauce that is irresistible. You could cook this recipe in a crockpot if you wanted to double or triple the recipe. I love to cook this creamed corn on the stove top. If you desire to use fresh corn you can use fresh corn off of the cob. Each cob of corn yields about 3/4 cup of corn. This would make a nice change from buttered corn on the cob. This recipe scales very well. I think this recipe doubles or even triples very easily. This recipe also reheats very well. You could even prepare this side dish a day or two before a special meal to make meal preparation easy. Love corn? Check out these other recipes. Make Rudy's Country Store creamed corn just like they do. In a medium pot over medium heat combine heavy cream and 4 ounces of cream cheese. Stir until well blended, and and the sauce is smooth and creamy. Add corn kernels, and stir them in. Heat until the corn is warmed through. Add salt and sugar. Serve with some fresh cracked black pepper if desired. Every time I go to Texas the first I do is see if there is a Rudy’s close by. I love the BBQ, but the creamed corn is what I look forward to the most. I have tried a few times to replicate it without success. Stephanie you have nailed it with this one. We made this tonight and it was awesome. Thanks for this. I used this recipe for church picnic and increased the size. Roasted dozen and half ears of corn on the grill the day before, cut off the cob and stored in ziploc. Next day heated a full quart of heavy cream, 8 oz reg cream cheese and small tub of chive and onion cream cheese with salt and pepper on stovetop. No sugar. Mixed with corn in 5 qt crock pot for one hour on high. Lowered temp and took to the picnic. Delicious! Thank you for this recipe, Stephanie! I made it for Thanksgiving in a crock pot and it was well received. We are smoking a turkey breast for Father’s Day today and decided Rudy’s corn was a must. I tried the suggestion of starting with a roux before adding the cream and cream cheese and it’s nice and thick. I’m letting it hang out in the oven at 200 degrees for a couple of hours. I have more cream on hand if I need to thin it a bit, but I think the consistency is going to be great for smoked turkey. Thank you!! I often make this recipe for a copycat of Rudy’s Creamed Corn, and I always use Philadelphia brand cream cheese. I find that it makes a difference in the taste. Philadelphia Cream Cheese, to me, just has a fresher taste to it. I also add the unsalted butter, plus I use a bit more than 1/2 pint of the heavy cream. I plan to add some chives and onion the next time I cook this up, to give this suggestion a try. We lived in San Antonio for awhile and we fell in love with Rudy’s.I make the corn every so often as it is awesome.i will have to try making the baked beans soon. I love the CopyKat recipe for Rudy’s creamed corn! It was easy to make in my crockpot and it was delicious! I have been looking for their Bar-B-Q baked bean recipe. My search online has been frustrating. I love the spicy, but not overpowering, taste of Rudy’s baked beans! We are going to have a party very soon, in Texas, hosting visiting non-Americans. I would like to serve this dish. I could cheat and buy it from Rudy’s but I would prefer it homemade, if possible. It is dead on because weve made it at home and Everyone asks for it often. I make mynown baked beans that are sweet and savory. Ibwill just give you what I use but Indont have any measurements because I dont measure anything when I cook. I taste as I go. Brown sugar, ketchup, a few squirts of yellow mustard, a few shakes of Worchestershire sauce. Bacon cut up into pieces raw. Mix all together and taste before you add the onion and raw bacon. Bake is pan in the oven at °375 until onion and bacon is done. My family loves these and asks for them often. The beans are made from trimmings from their meats. Would be too much trouble to recreate that recipe. You could add Rudy’s rub to beans. I think it’s in there. I wonder if the people having problems with it being too runny are using regular whipping cream instead of HEAVY whipping cream, there is a difference and it would make the final product more watery. I just made this and it is wonderful! Such a yummy treat after moving away from Austin six years ago. I ended up using only 3/4 of a pint of cream because that was just my personal preference for consistency, I started with a 1/2 pint and just added more until it got like I wanted. I also only used 1 tsp of sugar because the corn is sweet on its own. Oh, and I also added two tablespoons of unsalted butter. I bet that was delicious. There is no difference. Heavy cream and whipping cream team are two names for 1 product much like fat free milk and skim milk are two names for one product. The only one that’s different is half n half. They actually use regular sugar and there isn’t any cream cheese in it either. If you ask them what’s in it they’ll tell you plus they use roux (butter and flour) to thicken it up. So, what’s in it? Do you have the recipe, Austinite?